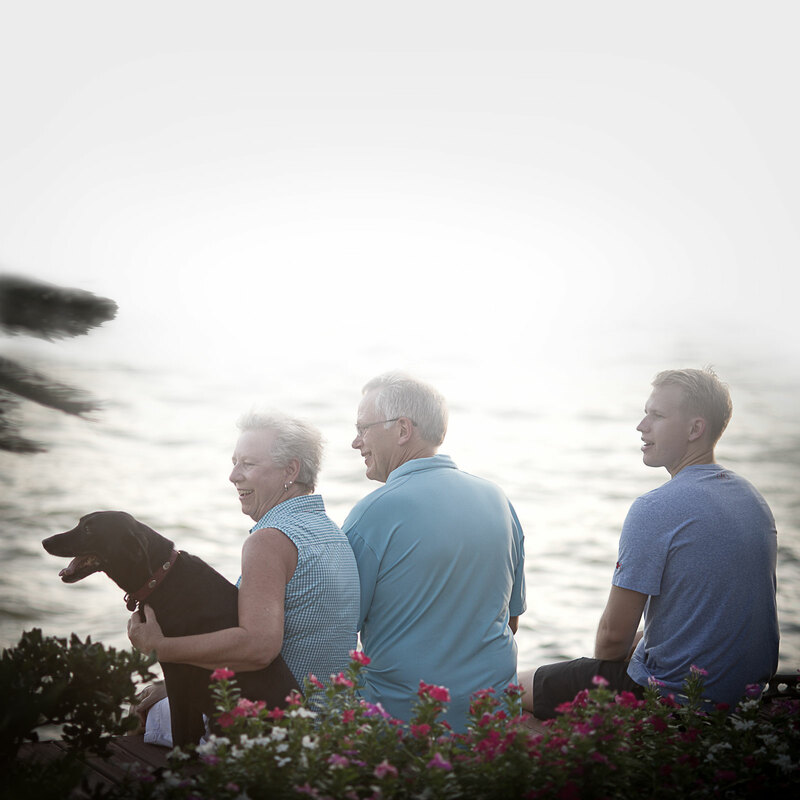 A single, strong, company-wide purpose defines Wärtsilä's actions in 2014. Scroll down to explore the year's stories​ and browse our facts, figures and analysis. on Wärtsilä’s past, present and future role in the gas value chain. Wärtsilä’s acquisition of Hamworthy plc in January 2012 enabled it to occupy a new and unique role of total solutions provider, serving the entire gas value chain. The expertise gained through the acquisition included small-scale LNG liquefaction, reliquefaction, regasification, and various LNG fuel handling technologies. In parallel, Wärtsilä had been developing the concept of Smart Power Generation, which positions gas as a swiftly reacting complement to renewable energy sources. Renewables typically produce drastic variations in the supply of electricity. Gas power plants equipped with our reciprocating engines can be quickly ramped up and down, or cycled, in response to these changes in demand and load. As Wärtsilä was already a technology leader in gas and dual-fuel combustion engines in the marine and power plant industries, the addition of Hamworthy’s offering was significant. Bringing power plant and gas handling expertise together gave Wärtsilä a uniquely broad offering, addressing every stage of the gas value chain. The gas value chain extends from the initial gas exploration and drilling processes to the production and liquefaction of LNG, which then has to be transported to storage and distribution facilities, and finally to the end users who utilise LNG in their operations. Wärtsilä has products and solutions that are relevant to each of these stages. The main application areas of both current activity and future promise include: cargo handling equipment for gas carriers, as well as engines and inert gas systems; small and medium sized LNG receiving terminals, which can be also offered as turnkey deliveries; complete fuel gas handling systems for all types of gas fuelled vessels; complete LNG handling solutions for small-scale LNG carriers as well as bunkering vessels; and onshore LNG production plant solutions for small and medium-sized liquefaction capacities. The terminals Wärtsilä supplies can also be built integrated with power plants, another important part of the value chain, completing the circle. Global trade flows clearly indicate a mismatch between the locations of gas resources and the consumers in need of them. This will drive investments in gas infrastructure worldwide, with significant growth in the number of importing countries generating an increase in demand for small and medium-scale receiving terminals and smaller gas carriers for regional trade. Wärtsilä’s recent project for Manga LNG Oy in Tornio, Finland, is a case in point: a turnkey contract to supply an LNG receiving terminal valued at approximately EUR 100 million. The terminal will enable the availability of LNG for industrial consumers in the Bay of Bothnia region, with beneficiaries to include shipping and road transportation companies, power and heat utilities, as well as other industrial and mining companies in northern Europe. John Hatley, Americas Vice President, Ship Power, expounds on Wärtsilä’s past, present and future role in the gas value chain. Born and raised on the coast in Seattle, Washington, John Hatley’s life was always going to revolve around the sea. Boating ran in his family and he would see commercial traffic such as coastal freighters and barges passing by their home daily. 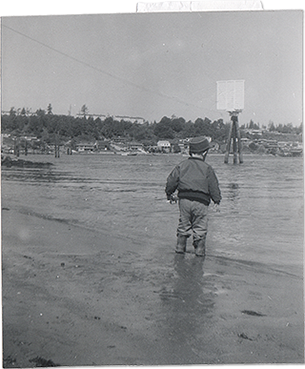 Thus began an education that would provide John with the perfect springboard into a career in the marine industry. 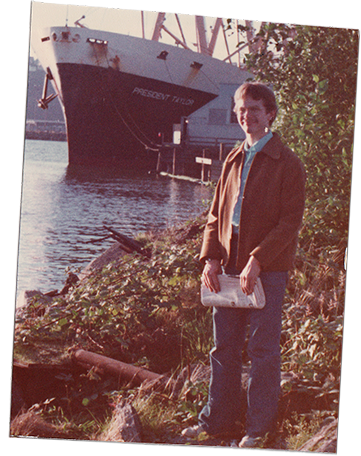 After graduating from King’s Point in 1976 with dual licenses as a Deck and Engineering Officer and a deep understanding of entire ship systems, from bridge to engine room, another unique opportunity arose: a graduate scholarship from the Society of Architects and Engineers. 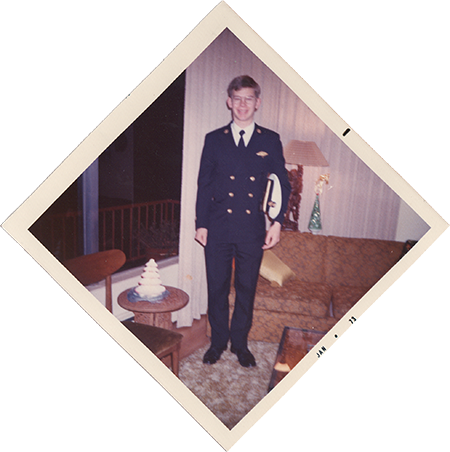 He used this to pursue his developing interest in ship design, entering the University of Michigan Master's programme to study Naval Architecture and Marine Engineering. 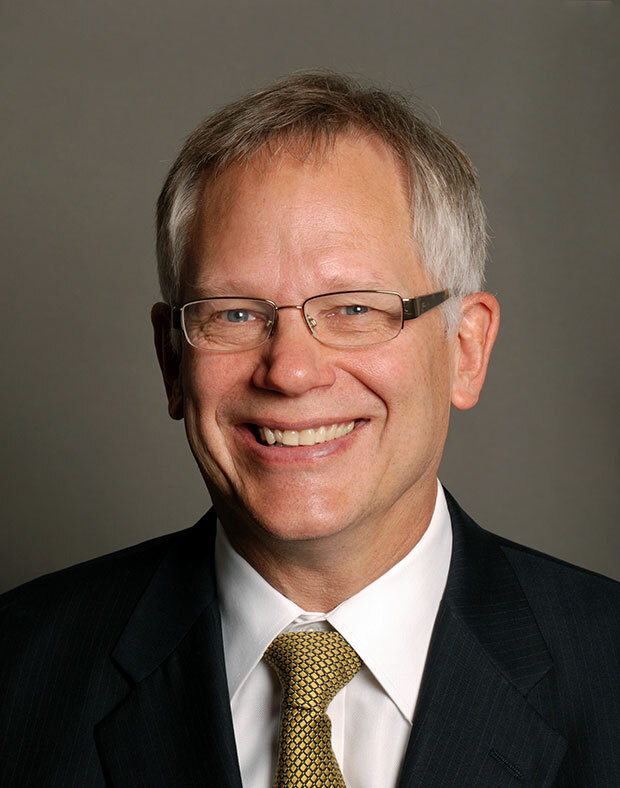 In the 80s, John became more and more involved in ship operations internationally, including a period in ship construction at Samsung with sailing time as a Chief Engineer in global shipping trades. Having worked on the move and overseas a great deal, it was around this time that he began to hear the call of the shore. With work experience covering virtually every perspective possible on the marine industry, the only unconquered territory for John was management. A helpful nudge from an executive of a Fortune 500 company provided the entrance he had been waiting for. To outsiders, Wärtsilä’s position as a supplier of LNG-related technologies and services in the current gas-centric climate may seem like a strategic risk paying off. With his decades of experience in the marine industry, John seems uniquely placed to explain the company’s series of fortuitous decisions. How did the role of gas in shipping shift during his career? During that era, LNG had no standing as a marine fuel, and LNG carriers utilised natural gas boil-off as their cargo tanks slowly warmed up during the extended ocean journey. As John explains, these ships also made alternative use of the gas to assist in their propulsion, initially in steam boilers, and then later, during the mid 1990s, as a fuel for reciprocating engines. This remained the case until the year 2000, when the first coastwise vessels in Norway, small ferries and off-shore supply ships, began to run on natural gas as a fuel. Wärtsilä addresses the whole gas value chain from market source to consumption, covering the entire energy spectrum. There is an infectious zeal to the way John describes the current business environment for both shipping and power generation, along with Wärtsilä’s potential within it. It’s little wonder he has earned the nickname of “gas ambassador” for the company. 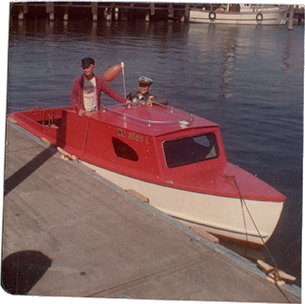 John’s newfound capacity to exploit the full quota of his skills evidently arrived at an exciting moment for the marine industry in general. A short talk with John Hatley demonstrates that Wärtsilä approaches the market with more than just this expansive technology offering. There are passionate experts behind this story, and their actions are navigating the industry toward a new course: its destination is the sustainable age of shipping. Wärtsilä gains a competitive advantage by introducing innovative industrial design solutions. Stepping from the campus thoroughfare into the building that hosts the Wärtsilä Innovation Node at Helsinki’s Aalto University, your first impressions are of a light, airy space. A large cafeteria dominates the lobby, and calmness seems to prevail over all the students in sight as they read, have quiet discussions over lunch, or seemingly drift quite unhurriedly from place to place. But this superficially relaxed exterior belies the importance and intensity of the work that takes place here, just as the Finnish education itself has consistently been ranked as one of the world’s best, despite lacking the near-manic pace and rigidly enforced discipline seen in other countries seeking similar results. The location of Wärtsilä’s R&D hub on this site is no accident, as Ilari Kallio, Vice President of R&D at Ship Power’s 4-stroke business line, explains to us. If this sounds like the introduction of entrepreneurialism into academia, that’s exactly what it is. This isn’t innovation for innovation’s sake, as a recent project providing smartphone-based assistance for service engineers demonstrates. Using the advanced communication capabilities of handheld devices as an alternative to the storage of paper manuals and written notes to instruct new service operators, the project might very well soon see fully-fledged development into an integral component of Wärtsilä’s service offering. This emphasis on user experience – while it has netted billions for certain consumer technology companies – is rarely seen in the industrial sector, where performance as measured in megawatts is a more acknowledged barometer of desirability. He goes on to outline the industrial design procedures that his team and himself have instituted, product by product, to bring the end user closer to the centre of solution planning. We go on to look at the products that have profited from this in-depth research. In Wärtsilä’s new 4-stroke engines, not only do we see the outer visual identity of the engines, but also the design work encompassing every aspect of how human beings encounter and interact with the product. 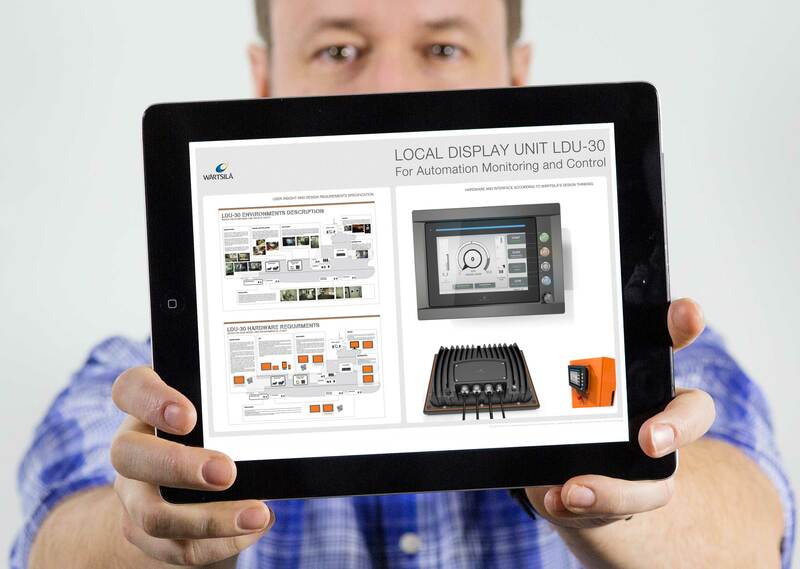 This design approach also includes the new LDU-30 local display unit, used for controlling and monitoring an engine. The UX design also covers software interfaces, even going so far as to detail the software used to configure the programme that service engineers will use in their daily work. Optimisation for the user is one of the most important dimensions to industrial design. 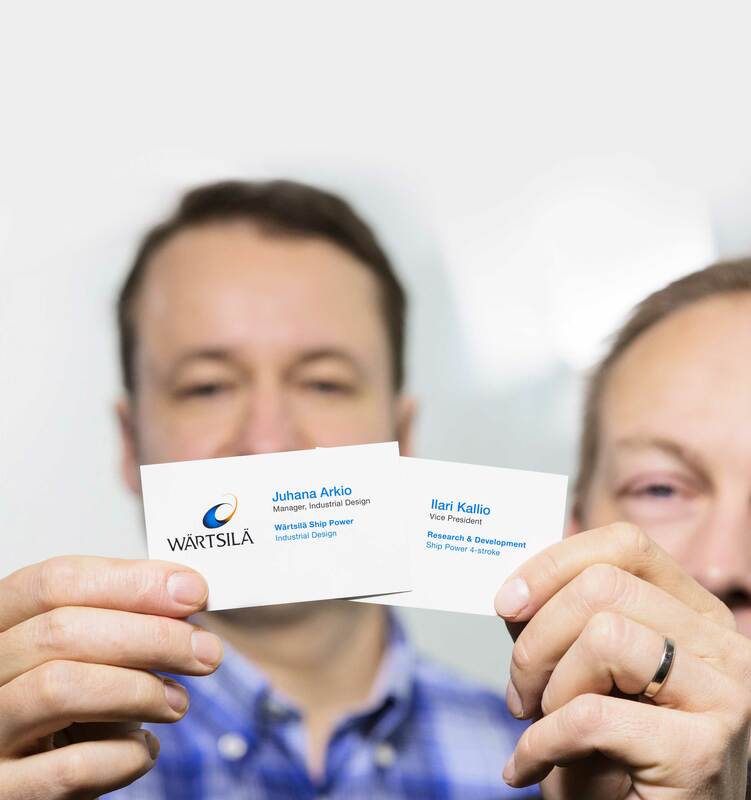 Another is the product identity, and the way it reflects Wärtsilä’s values and ambitious goals. Juhana sees this as descending directly from the company strategy. The fact that both Ilari and Juhana work under the banner of Ship Power’s 4-stroke business line, yet have done extensive work on innovations bridging each of Wärtsilä’s other business areas leads us to enquire precisely how R&D functions in the organisation. For Ilari, the key phrase is ‘entrepreneurial thinking’. “If I see an opportunity or synergy with some other business line, there ́s nothing that hinders me from capturing that synergy. Even if we have our own responsibilities, it doesn’t mean we can’t collaborate proactively. Entrepreneurial thinking is our route to the easiest, most productive and most economical ways of working. Organisational structure doesn’t have to limit collaboration if you see there is a benefit. Design innovators evidently do not see corporate structure as any barrier to inventing and implementing new, beneficial solutions, but Ilari reaffirms that company strategy provides the direction for their work. “The broad strokes are,” he explains, “decided at the management level. Directions like gas, fuel flexibility and Smart Power Generation are established there. But as they pass down through the organisation, finding application in each of the different divisions and then, in turn, the business lines, these decisions translate into a huge variety of different opportunities." When all is said and done, the customer is the purpose of creating innovation. At the Innovation Node, this means finding new ways to add value at each stage of the product life cycle, and looking ever onwards to the solutions of the future. Our personnel help to drive change for the better for girls in developing countries. In early 2014, Wärtsilä personnel in Finland selected a charitable initiative for the company to support. The combination of a well-chosen partner, a strong group effort, and a unique internal initiative should help drive change for the better for girls in developing countries. 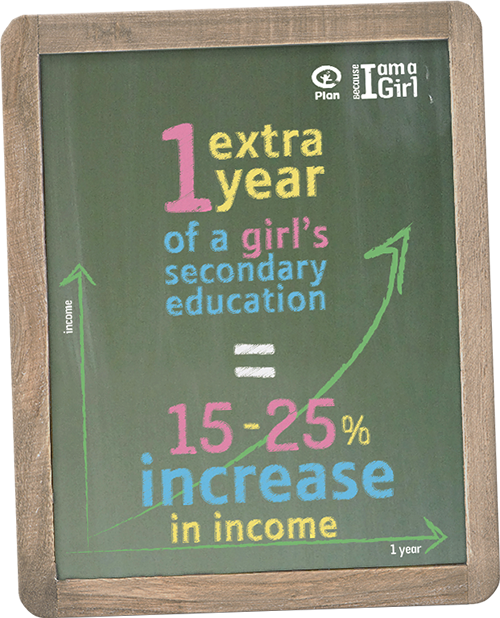 62 million girls are unable to go to school and that every year in higher education increases a girl’s future income by 15–25%. 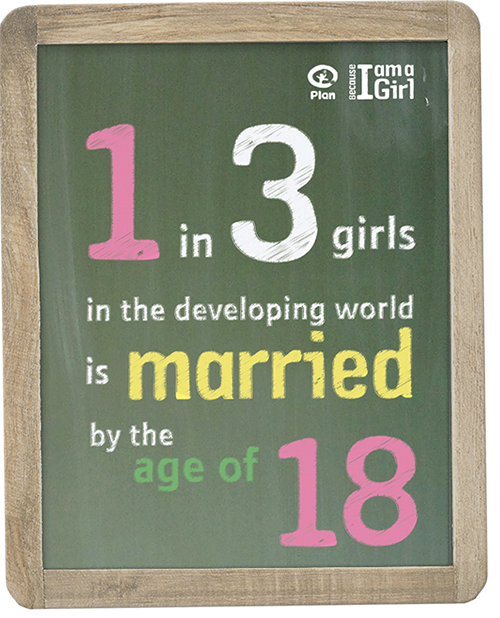 Every day, close to 40,000 girls get married and a third of them are under 18 years old. 50,000 girls die yearly because of complications in pregnancy or delivery. 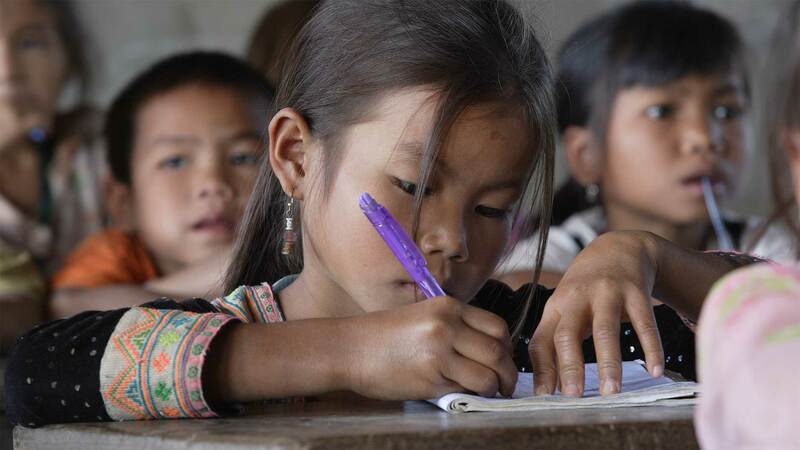 Plan International’s ‘Because I am a Girl’ campaign aims to support millions of girls in getting the education, skills and support they need to transform their lives and the world around them. Wärtsilä employees in Finland selected the campaign from a number of other worthy causes to be a joint initiative between personnel and the company as a whole. Plan International works with millions of children in 86,000 communities in 51 developing countries across the world and is continuously looking for new ways and opportunities to advance the achievement of gender equality and girls' rights. 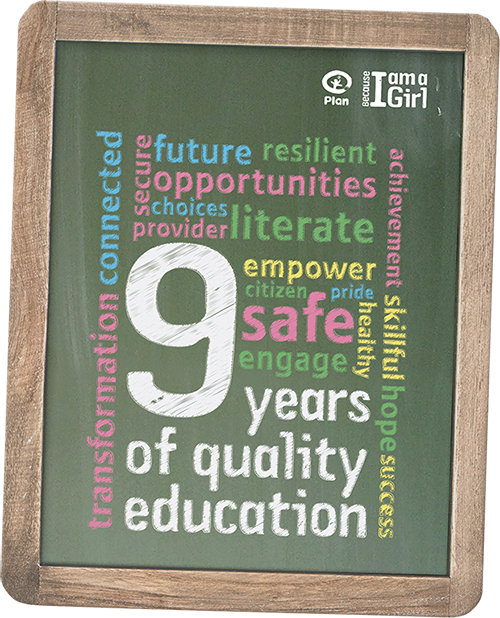 Through the ‘Because I am a Girl’ campaign, Plan‘s projects will address the barriers to girls completing a quality education of at least nine years, as well as equip them with the assets they need to safeguard their future, promote gender equality and improve their lives. The practical arrangements of the donation programme were launched for personnel at Wärtsilä’s headquarters in April, and continued onwards to Vaasa and Turku in October. These took the form of what is known as a ParticipAid programme: a voluntary charity framework. Personnel were invited to make either a one-time or monthly donation, which would be automatically deducted from their net salary. These one-time donations were then matched by Wärtsilä, who pledged to double every euro donated, passing on the final sum of € 27,146 to Plan in December. "Girls’ education is the best and strongest weapon against poverty in the world. Thank you to everyone who participated in the campaign!" This arrangement of deductions from employee salaries for charitable purposes is one of the first of its kind for Wärtsilä. Both parties hope that the combination of a well-chosen partner, a strong group effort, and a unique internal initiative will drive change for the better for the girls affected by these hardships.